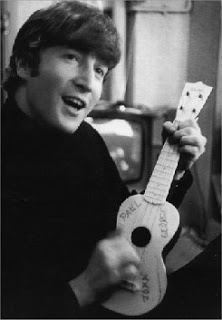 John Lennon with his Beatles Uke! Have you ever wanted to play a musical instrument but never had the time until now? It's never too late and it's a great way of keeping your brain engaged and the fingers movin'. This group for total beginners will teach you to play the Ukulele and have fun at the same time playing both traditional and pop songs. Ukuleles are very simple instruments to learn the basics on, and these sessions are aimed at the complete novice. You can just turn up, but it would help if you could contact us in advance using the Contact form on this website (or by emailing admin@mayboleover50s.org ) if you are interested in taking up this great opportunity! What have you got to lose? The Ukulele group meet on Wednesday afternoons at 2pm for approximately an hour or so.